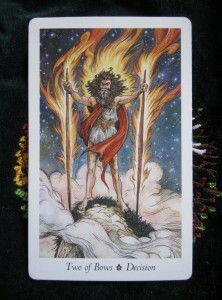 Today’s card of the day is the Two of Bows with the key word of “Decision”. It shows a man, standing on top of a hill, a little like Zeus atop Mount Olympus. What decision has he made? 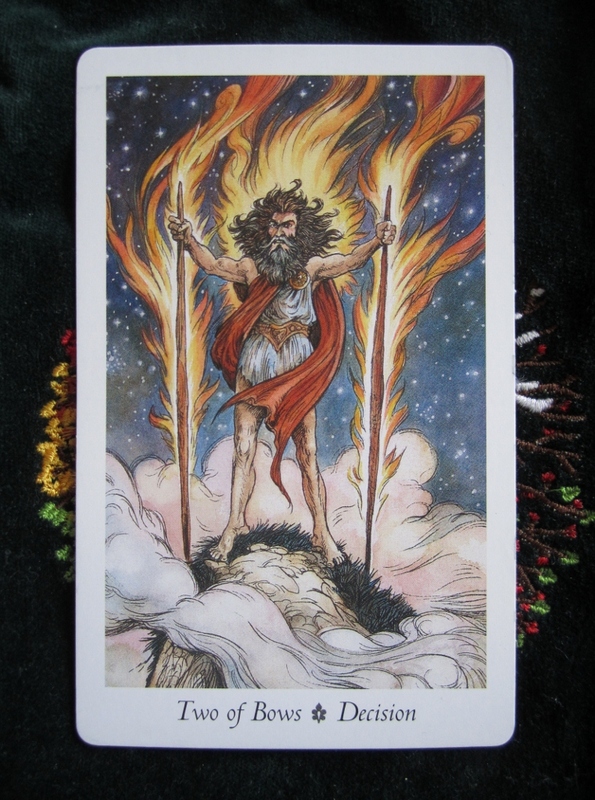 There’s a vast amount of fire showing up in this card, as well as the air surrounding him. I have to ask what decision is he hinting at today? Do I engage? Do I not? Do I sit on the sidelines, or do I stand up and be counted? I know it’s not easy, putting your head up above the parapet and being counted. But sometimes, saying nothing is an endorsement of the bad action being done. And sometimes to do so puts others that we love more in danger or in harms way. It’s a fine line to walk and the decision has to be reassessed with every step. So, whatever you have to decide today, keep it balanced, keep it focused and most of all, I wish you peace, be with you!